Take US 52 North from Winston-Salem to the King/Tobaccoville Exit (#123). After 2.2 miles Brown Road will dead end into Chestnut Grove Road. Turn right onto Chestnut Grove Road and travel .5 of a mile. Turn left onto YMCA Camp Road. 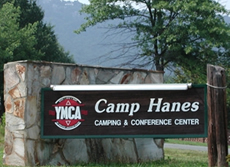 Travel 3.7 miles and turn left onto Camp Hanes Road. Follow the road on into camp. Take I-40 West to Winston-Salem. Take I-85 North to US 52 North.